Robin Hood Treasure Hunt Escape info about the game-Games2Rule. It is one of the many adventures of Robin Hood. In this escape game, some bad guys trying to escape from the town with public treasure. Robin Hood need to save that treasure from them. 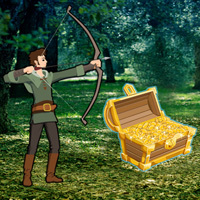 You have to help Robin Hood to reach them by finding useful objects, hints and solving puzzle.